So, our road trip has taken us from Knoxville area, Tennessee to Nashville, Memphis, a tiny dot on the map called Clarksville, Arkansas, Elk City, Oklahoma and now Albuquerque, NM, which is where I am posting from this morning. Since we left Knoxville, we've managed to listen to books 7 & 8 in the Alex Rider series, which have entertained all three of us enormously. 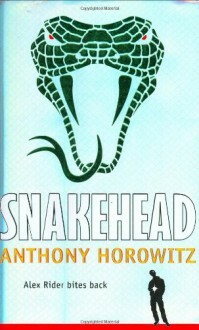 Anthony Horowitz's boy spy, Alex Rider, has had a rough year, for sure! We have about a six hour drive into the Phoenix area, where we will spend tomorrow with my parents, and then head north to Flagstaff and the Grand Canyon on Saturday. From there it's Vegas and then Reno and then home! 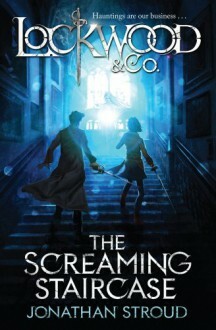 Next book up is the first in the Lockwood and Co. series by Jonathan Stroud! 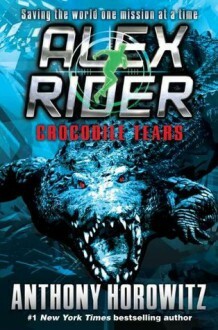 I will be claiming Genre, Suspense and my Free Square with the two Alex Riders, and supernatural with Lockwood & Co, when I get some time to update. Right now, I'm having breakfast, and then we will hit the road. This is my recommendations book from Jonathan Stroud. Another library find. While I feel I would have enjoyed the 'spooky' parts more when I was younger (Middle grade, or high school age) I still really enjoyed this one! I didn't find it very scary like I've seen others mention, but for a kid's book, it definitely has some places that make you want to read with the lights on! I loved the characters, especially Lockwood and his friendship with Lucy, but all of the characters were well written and interesting. An entertaining book, even though it didn’t blow my mind as I would’ve expected from the author of the “Bartimaeus” series. In a United Kingdom where the dead tend to come back fairly often as ghosts—whose touch is lethal to the living—agencies have sprung up. Gathering all kinds of young people with the ability to see or hear spectres, under the supervision of adults, these groups patrol cities at nights and investigate various hauntings, in order to send ghosts back to the grave. Lockwood & Co. is one of such agencies. And so, when young agent Lucy Carlyle finds herself looking for employment in London, she applies for a job there… an unusual one even for her line of work, since Lockwood’s doesn’t have any supervisor, and his two other youth are a little on the reckless side. Well, especially Lockwood himself. This trio of characters follows a typical dynamic (2 boys, 1 girl), with banter and sometimes tense relationships. Lockwood tends to act before thinking, and appears as too easy-go-lucky at times; George is the librarian, the one who remembers they should do their research before investigating; and Lucy, the only one of the three with the ability to hear ghosts and potentially communicate with them, is somewhere in between: more thoughtful at first, yet possessed with instincts that sometimes cause her to make strange decisions. All in all, this dynamic highlighted potential flaws in the team (Lucy didn’t tell them immediately why she went to London, Lockwood doesn’t talk of his family or why there are no adults supervising his agency…) as well as room for growth (learning to trust each other, among other things). The descriptions of ghosts, places and hauntings are vivid enough, and it’s very easy to picture every happening. They convey an idea of a darker London, whose mists may not only be mere pollution or weather-related, but also announce the coming of ghosts. The story as a whole, a bit like in the Bartimaeus series, has a semi-Victorian feeling: the time is now, yet readers may find themselves forgetting this since the era itself isn’t so important (and the use of rapiers and iron filings could go well in a historical setting). This may or may not be a problem; personally, I quite liked it. The atmosphere throughout the novel, though, wasn’t exactly horrific for me; I’m not sure if I could consider it the right amount of “scary” for a ghost story presented as such. - The plot felt too disjointed when it came to its two main parts. I’m not sure why exactly, nor what could have made it better, but I got this feeling that the cause-and-effect relationships were forced together, instead of one appearing as logically following the other. - I could have done without the fat-shaming (towards George). I don’t know if this was supposed to make Lockwood (tall and thin) look better, or Lucy appear superior, but it achieved neither. I really don’t see any point to that. - I mentioned the characters’ dynamics and room for growth, however by the end of the book I thought this was lacking a bit, and the team didn’t feel like a team as much as I had expected after all the “surviving together” (the fire, the burglary, the Red Room…). The relationship between Lucy, George and Lockwood remained a wee bit… flat? Conclusion: 2.5 stars. I enjoyed it on the surface, as light reading, but I’m not particularly eager to pick up the second book either.